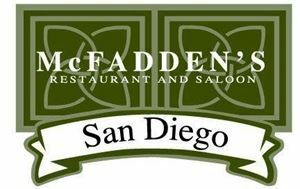 Come to McFadden's San Diego for all of your party needs: Birthday, Bachelor/Bachelorette, Sports Game Watch, Reunion, Alumni and Corporate Happy Hour. McFadden’s Restaurant and Saloon, the “Wildest Irish Pub on Earth,” has moved to sunnier pastures. The predominantly East Coast party bar has arrived in San Diego!